I know— it’s hard to believe. This summer marks 15 years since the Parker and the Man story began. It comes from humble beginnings but it’s a fascinating tale! Figured I would write that so you read longer. 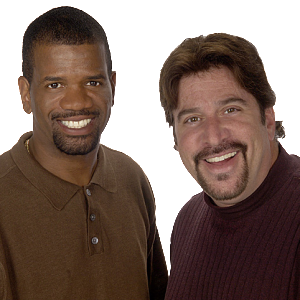 Just about this time in 1998, we were looking for a permanent morning radio show at Detroit’s original sports station, WDFN AM 1130 “The Fan.” I was doing a “temporary” show with Oakland Press columnist and Detroit Tigers’ beat writer Pat Caputo. Pat, of course, is a longtime host on WXYT-FM since the switch to sports full time. Remember, DFN was the one and ONLY sports station in Detroit. Next year they will celebrate 20 years in operation albeit that operation has sunk to new lows. They are no longer downtown but instead in the slick Clear Channel building at 12 Mile and Halsted. The station was talking to us about a more permanent situation with contracts and everything. Pat decided he couldn’t keep up with the hours and still have time to do his newspaper job and keep a marriage alive. I was enjoying doing the morning show and even figured out a way to make the hours manageable. So, we went on the hunt for a Caputo replacement. We held “on-air” tryouts to find a co-host. I was just Mark Wilson. There was no “Man” yet. Maybe some other time I will go into some of the folks that we brought in. I can say that one of the participants was current WFAN New York morning superstar Craig Carton who pairs with former NFL QB Boomer Esiason. Side note about Carton, he was featured last week in an episode of USA-TV’s “Royal Pains.” I know this because I watch that show. It’s a guilty pleasure— get over it. Carton and others came and went. When it was over, our program director said the name Rob Parker. Immediately I responded that Rob was working in New York, his hometown, and why on earth would he come back to Detroit? Parker was part of the original WDFN cast co-hosting the “Odd Couple Show” with Mike “Stoney” Stone in the afternoons. It lasted less than a year before Rob was off to the apple. As everyone knows, Rob was a newspaper columnist as well; his main gig over radio. I was told that his wife was from Detroit and he was LOOKING to make a return. In a nutshell… that’s it. No crazy, wacky story. No controversy or uproar. I said, “Cool— let’s do it” and we did. Rob and I didn’t know each other that well. We went to the games, spring training; usual media stuff and that was the extent to our relationship. But, I had always liked what he wrote and I liked the short time he and Stoney did the PM drive on DFN. Naming the show was left to Rob. He’s a huge fan of old television programs and wanted something to reflect that. Hey, I like old TV like the next guy but quite frankly, I didn’t give two hoots what it was called and figured Rob was creative and he wouldn’t steer me wrong. Then again, he initially wanted to call us— wait for it— “The Morning Munsters.” I’m sure he would have been Herman and I would have been… uh, well… either Lilly or Grandpa. Luckily, he settled on a take-off of the old “Chico and the Man” program. He kind of sold it as I would be “The Man” trying to keep my “brother” down. A little yin-and-yang thing; ebony and ivory. As long as those checks came every two weeks, he could use any explanation he wanted. Again, no great story there. Rob wanted “Parker and the Man” so… “Parker and the Man” it was! I actually liked keeping my name off it just in case it didn’t work and then all the blame could go to him. Of course, they could always replace “The Man” with another “Man.” Unless we could find another “Parker,” he was solid. I didn’t see Sarah Jessica or Fess or Peter or Dave or Charlie or any other Parker coming aboard should Rob beg out. Ironically, our last day at CHB was the day of the Red Wings’ parade for winning their most recent Stanley Cup. Poetic justice! If that’s not a classic case of, “What goes around, comes around,” I don’t know what is! You can still see some clips of that on YouTube. Enjoy! It’s a classic! 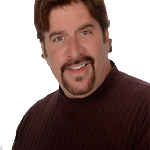 Mostly, Rob has written for the immensely popular WDIV local website “Click on Detroit” and was a longtime employee of ESPN. I’ll let him explain his much-ballyhooed departure if he wants too. I went on to do a radio show in Las Vegas and start up a production company for other audio and video projects. Vegas was a blast with my co-host, the lovely and talented Jessica Hall who is now doing well down in Florida. Since 2008, the only times Rob and I have gotten together to do any radio was on Ron Cameron’s Sunday talk show on WDFN. (That would be more “what goes around, comes around type of thing) Also, when I took the gig at ESPN Detroit 1090, we did ONE reunion program for three hours that got more calls than any other show I’ve done there. We recently ended our affiliation with ESPN and switched to the NBC Sports Radio Network. Basically, it’s been over five years since we paired together for a regular radio deal. I KNOW— five years! I can’t tell if that’s a long time… or a short time; kind of feels longer than five years. But still, everywhere I go I get asked about Rob and when we’ll do a show again. Hell, I even got it in Vegas. As it turned out, Bernie was wearing one of the many shirts Rob had made and gave us over the years. Who knew? Many Detroiters make their way to the Mojave for some gaming and whatnot at the various Vegas casinos and I don’t know how many times I got recognized, mostly from my TV days at FOX 2. 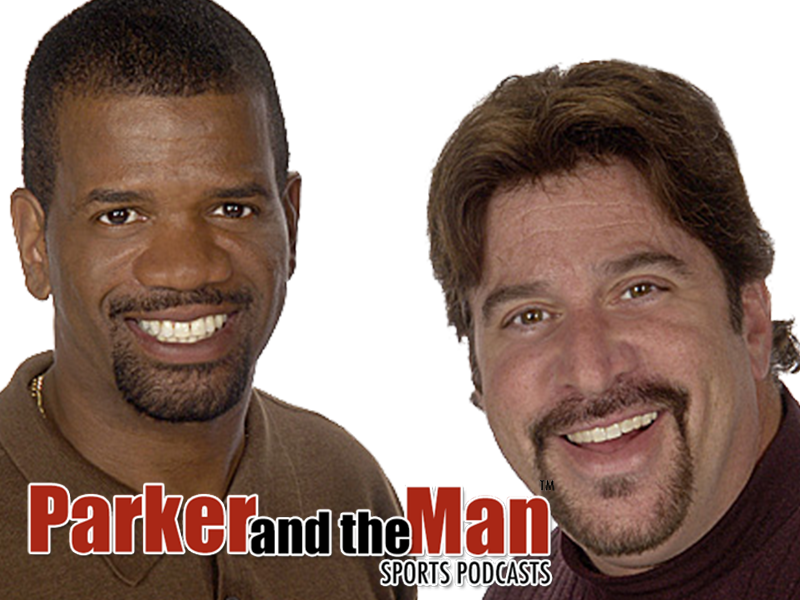 They would stop me to ask about… the “Parker and the Man” show. They’re the ones that kept the “dream” alive. We’ve got a website now and pod casts are on the way. We were one of the first in the USA to have shows pod casted by CBS when this internet thing really started to take off. We were almost a test case. Thanks Al Gore! Quite an invention you got there fella! It only took 15 years but we are jumping head first into the 21st century. Timing is everything people! Keep checking back for more blogs and pod casts and merchandise (Sure, we’re going to try and sell stuff because we’re not above it!) Who knows, maybe we’ll give away some stuff for FREE! Shhhh… don’t tell Rob I used his dreaded “F” word. He probably STILL hates us. Just think. If Pat Caputo had stayed on? I wouldn’t be typing this today. There might not have ever been a “Parker and the Man.” Don’t worry Pat; I’ll see if I can get you a free hat and t-shirt.